I'm Curious Too: Lost People Wander in Circle: Truth or Fiction? Well, we've seen it all in the Lord of The Ring, and they didn't seem to go off-course did they? A researcher named Jan Souman tested this in 2007. He dropped three volunteers into the Sahara desert and watched as they walked for several miles, in an attempt to walk in a straight line. He then tracked the volunteers using GPS as they strolled through the terrain blindfolded. The result: they did indeed go in circles but with no preference for any direction and only when they couldn’t see or when the sun or moon weren’t visible. Scientists have put forward many explanations for the circular rambles of lost walkers. Some say that most people have one leg that’s longer or stronger than the other and over time, these differences add up to a curving course. David Beckham, for one, has a longer right leg. Others say that asymmetries in our very brains set up a tendency to turn in one direction. Without a guiding light or landmark, these small biases would make their presence felt. 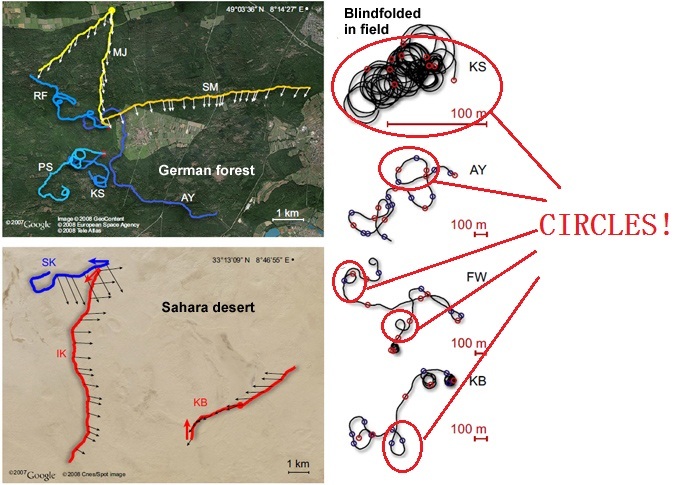 But the results shows that all of them walked in very random paths, sometimes left and sometimes right, and this subsequently dismissed the asymmetric legs or brains hypothesis. Only three of the 15 people consistently veered in one direction and they did indeed go round in circles; the others walked more chaotic paths. On the whole, their meanderings had no consistent bias and they would turn one way as often as the other. So without landmarks to guide them, the walkers were relying on feedback from their bodies (proprioception) and their sense of balance. These cues can help over short distances, but the researcher says that they soon build up “sensory noise” that renders them inaccurate and causes the person’s trajectory to drift both increasingly and randomly--Ed Yong(notrocketscience). Despite walking for 50 minutes, most of these people never made it very far. And that's with the blindfold on. Without it, we can actually reset our navigation. 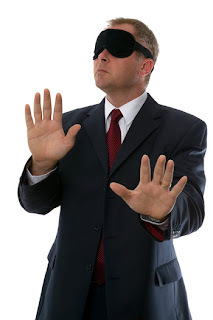 If Souman allowed his blindfolded bumblers to lift their blindfolds for a minute out of every five or ten, they managed to recalibrate their sense of “straight ahead” and started walking in a straight line again. It seems that walking in a straight line is not so simple after all.